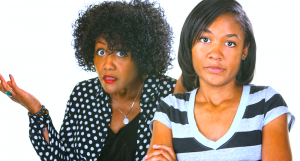 You are here: Home / / African-American mothers destroying her daughters-How this is a mostly silent issue among females in the black community. African-American mothers destroying her daughters-How this is a mostly silent issue among females in the black community. Living vicariously through others is a normal part of the human experience. We all live vicariously through someone else at some point in our lives. As long as healthy boundaries are maintained, and a strong sense of self-appreciation is present, living vicariously is not usually a problem. Mothers, and grandmothers often live their lives vicariously through their daughters, and granddaughters. It is unfortunate, but owing to the African American’s continued struggle to obtain a sense of self, and true freedom,guidance by mothers, and grandmothers is still needed.Quite frankly, this guidance may always be needed. This is a worthless, garbage article. If you’re going to unnecessarily disparage black women, at least provide substantial evidence to support what you’re saying. You repeat the statement several times that black women destroy their black daughters yet your reasoning is generic and flimsy. I’m sorry but this article does not rise to the level of writing worth publishing. My suggestion to you is that you deal with your own “mom issues” instead of venting this baseless information on the internet. It is vague and repetitive. Ridiculous.